As an eminent journalist you are entitled to have your own views, and over the years I have always held your journalism in high esteem. Unfortunately, the article written by you titled: “Narendra Modi and why 2002 cannot go away” was blatantly biased. Communal riots, whether the 1969 Ahmedabad riots in which over 1,500 Muslims were killed or the 1987 Bhagalpur riots where over 1,000 Muslims were butchered or the 2002 Gujarat riots, every one of them is condemnable. First, the real issue is: what was the response of the Gujarat government during the 2002 riots? No doubt, several invaluable lives were lost and properties destroyed in the riots. But to charge the Gujarat administration and police with having shown complicity with the rioters is nothing but crude propaganda. As we all know, the Godhra train carnage in which 59 kar sevaks were brutally burnt down sparked the riots on the morning of February 27. As the trouble broke out, a 70,000-strong police force was deployed to control the situation. The Gujarat government also promptly sought the Army’s help the very same day. Even as the Army was to be mobilised from the border areas (which was done overnight), on the second day itself (February 2002 was a 28-day month), the first flag march of the Army contingent took place in the wee hours of March 1 and The Hindu itself had reported it. Can you recount any riots in the country where 170 rioters got killed in police firing? Had the Gujarat Police and administration shown complicity with the rioters, could such police action have been expected? Therefore, one should not allow the truth to get suppressed under the thickness of bias. Second, describing the Gujarat riots as a “pogrom” is nothing but a canard. The “pogrom” was the violence unleashed and subsequent massacre of 8,000 Sikhs in Delhi in 1984 by Congress cadres instigated by its top brass after the unfortunate assassination of the then Prime Minister, Indira Gandhi. The 1984 anti-Sikh massacre was an organised killing by members and leaders of a single political party. Third, as stated above, all efforts were made to control the riots in Gujarat and criminal action was taken against the rioters, whereas in 1984, no effort was made to stop the massacre. Leave alone firing shots at rioters, the police did not even wield lathis. Not many arrests were made despite the fact that nearly 8,000 Sikhs were killed in the massacre. To my knowledge, not even one person was shot dead by the police or the army. The police was conspicuous by its absence for three full days. The army, though available locally, was not called for three full days. But these riots escaped the media glare because in those days, television was in its infancy. Fourth, why do learned people like you conveniently forget about several other bloody riots which took place under Congress rule and selectively choose to point fingers at Mr. Modi for absolutely no fault of his? Is it because he is posing a democratic challenge to the corrupt, directionless and weak government led by Dr. Manmohan Singh? Fifth, as far as the apology of Prime Minister Manmohan Singh to the Sikh community for the 1984 riots is concerned, you yourself have pointed out that it came from a person who was in no way accountable for the riots. What was the use of such an apology when the former Prime Minister, the late Rajiv Gandhi, shamelessly justified the killing of thousands of Sikhs by asserting that “When a big tree falls, the earth trembles?” In contrast, Mr. Modi never justified the riots and acted tough in every possible capacity. Therefore, is it not wilful omission on your part to conveniently spare former Prime Minister Rajiv Gandhi and the Congress, under which numerous riots have taken place in this country? While Mr. Modi’s adversaries spare no opportunity to paint him communal, the Gujarat Chief Minister, despite unceasing criticism has been able to reach out to people, including Muslims, through the rope of “good governance.” He has not only set the agenda of “good governance” rolling ahead of the 2014 Lok Sabha election, but also united the people in the State under the umbrella of good governance. But for the political gimmickry, even his adversaries will have to admit that the fruits of growth in Gujarat have touched people belonging to various castes, creeds and religions. A lot more development needs to be done, but the agenda of good governance set out by Mr. Modi is spreading fast and touching new lives day after day. Those who accuse the Gujarat administration of being anti-minorities could be silenced if the following statistics were considered in earnestness. Of the total population in Gujarat, Muslims are less than 10 per cent. But 12 per cent of the police personnel in Gujarat are Muslims and 10 per cent of the government jobs are held by Muslims. The economic uplift of Muslims in Gujarat can be gauged from the fact that 18 per cent of the RTO registration of new two-wheelers is by Muslims. Their four-wheeler registration also is higher than their proportion in the overall population. On the contrary, West Bengal has the highest, 25 per cent, Muslim population, but even after 30 years of Left rule, only three per cent of Muslims are in government employment there. The world today knows Gujarat for the growth story and for its immense economic potential. The Hindus and Muslims of Gujarat are both part of the growth story. Still you have chosen to relay a false threat that the advent of Mr. Modi would be a danger to the democratic and secular ethos of India. It is unfortunate that you conveniently forgot the autocratic rule of the Congress, which the country bore during the Emergency, imposed by none other than Indira Gandhi. In a democracy, everyone has the right to put across his viewpoint and agenda to people. It is the people who accept or reject them. The Congress-led UPA government has become synonymous with corruption, lack of leadership, policy paralysis and economic mismanagement. On the contrary, the implementation of the development agenda in the BJP-ruled States with earnestness is getting translated into mass support for Mr. Modi in rural and urban areas alike. People want to move on and are yearning for “good governance.” That is why Mr. Modi has caught the popular imagination of every youth, or aged, literate or semi-illiterate people of this country and is working hard to realise it. 1st round: GSAT (consists of Data interpretation, aptitute(only 5 questions) and analytical reasoning). This paper was similar to SISC GSAT paper, unfortunately didnt remember the questions. b)parent is always greater than both of its children. In c/C++ section questions were from pure virtual functions, difference between overloading and overriding, abstract classes, default access in class and structure, inheritance etc. 1. Solving the tic tac toe puzzle, to write a program and or pseudo-code, or explain using flowchart. the HR gave us hints to solve it using automata theory, or min-max algorithm, or soft computing or AI anything that we wanted. 2. Given a string, say “SAMSUNG SOFTWARE”, print it in reverse manner eliminating the repeated characters. the program should be optimised in terms of time complexity, space complexity, power complexity and lines of code. It should not be a two step program, i.e. first reversing and then eliminating. The interviewer was asking something in terms of O(n) or even less than that. He asked me about my training, it was on android. He started asking me questions on android. What is an adapter in android? what is activity how does it actually communicate?? what did they mean and then he gave me a c question to tell me the output. const was being incremented there so it was a compiler error. Then he asked me to write a program to print 1 to x given x as input without using any loops. I did it using recursion. next, are you familiar with semaphore and mutex? what is it? and which one u think is better? can you write a program to reverse a linked list. I used three pointers in my program he then asked me have you done this program earlier? what is virtual memory and how is it implemented? and kept on circling around for quite some time asking different questions related to paging. few questions were about allocation of memory and caches. 5th round: He picked out my algorithm round paper and started asking me about the questions. how can it be optimized more. i didn’t answer as quickly as earlier. Why do u think we should select you today? I told him few points 😉 and then my interview was over. 1. Download SystemC source from Accellera website. 4. Make a directory systemc230 for installation in your /usr/local/ path. You are done with installation of SystemC 2.3.0. This version is packed with TLM package also. Now we can run our first Hello World! program. //Print “Hello World” to the console. Save the file as hello.cpp. Use following command to export a variable SYSTEMC_HOME. 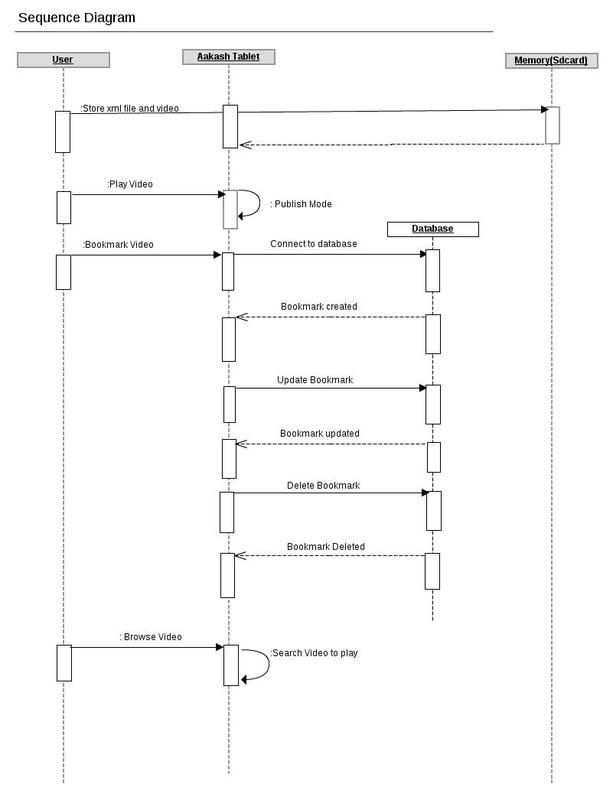 The report for the project is almost done.This is the sequence diagram for my project. 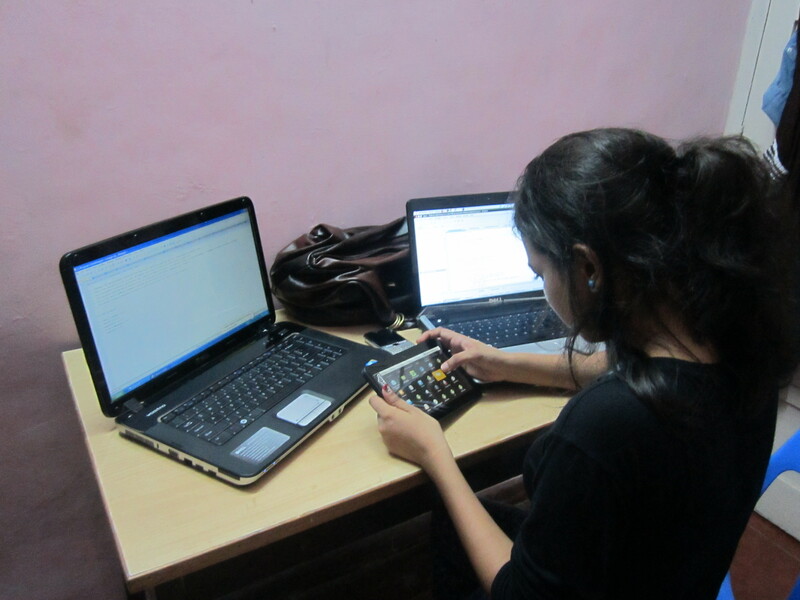 Preparing the presentations and other requisites. 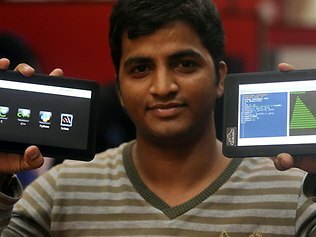 One of our mentors “Ninad Chilap” with the Aakash tablet. “In coming years, Aakash is likely to become a ubiquitous tool in the hands of students, at all levels of their education,” said Professor Deepak Phatak, heading up the project, in a release from IIT Bombay. Busy with the final brush up off with the project. Project reports, presentations, etc. Ninad sir mailed the outline for the project report. Software engineering subject is really useful. Hope to complete all the work till sunday.